- 10% discount until 15 Nov 2018. The offers can not be combined! Location: The hotel is situated in the centre of the resort of Borovets (1300 m above the sea level) and only an hour drive from the capital - Sofia. The eleven store building in alpine style, surrounded by old pine forests, offers pleasant atmosphere and first class service throughout the year. Comforts in the hotel: The four star category of the hotel attracts guests from all over the world - with the large rooms and apartments, congress center with eight halls and a great variety of extra services - indoor swimming pool, sauna, solarium, steam bath, fitness hall and etc. The hotel is a starting point for short and long routes in the magnificent Rila mountain. 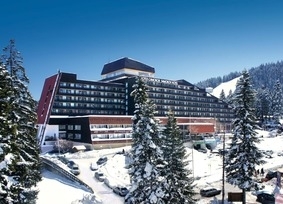 Samokov hotel offers: 250 standard rooms with all necessary facilities- mini- bar, direct telephone line, satellite T.V. , bath with tab, balcony with a view to the mountain. 11 deluxe rooms and 4 suits - providing perfect combination between business atmosphere and home coziness. Barbecue terrace Only few steps from the swimming pool you are welcomed in the Barbecue restaurant. Delicious grilled specialties, fresh salads, cold drinks- these are small part of the things you can try here. Lobby bar Situated in the lobby of the hotel it offers different cocktails, hot drinks, a great variety of cakes and sweets. Coctail bar This is the place to offer an exotic drink, to play billiards with friends. “Sport” bar The right place for a glass of cold drink and to have a rest after the hard work in the fitness hall. "Pool” bar If you need refreshing drink after the tiring swimming in the pool – visit the Pool bar. Night club & discoteque Samokov hotel offers you a nice way to spend the evening – in the night club, with its 220 seats it provides plenty of different cocktails and favorite music. Sport and Spa The sport and spa centre offers various opportunities for sport and relax: modern fitness hall, indoor swimming pool (25x12.50 m), bowling, billiard’s, table tennis, massage - full or classic, aromatherapy, hot stones therapy, water massage, pearl tab with etheric oils, hydro jet, solarium, sauna, steam room. Hotel Samokov just opened a brand new thermal zone including Turkish bath, steam bath, Finnish sauna, aroma sauna, kneipp walk, shocking tub, ice pool and a relax zone. Congress centre Samokov hotel has eight congress halls with capacity from 15 to 600 seats and equipped with modern presentation facilities - the variety of congress services can satisfy the highest requirements of our guests. And all this combined with the professionalism of our team - is a guarantee for the success of your events.